Heat oil in a medium frying pan over medium heat. Add bacon. Cook, stirring occasionally, for 5 mins or until golden. 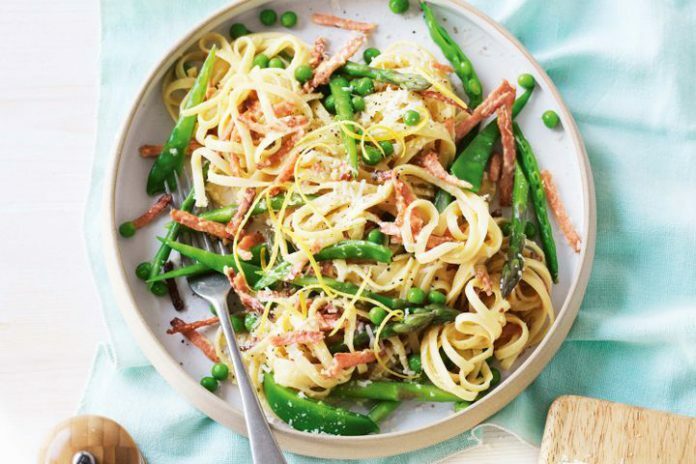 Meanwhile, cook the linguine in a large saucepan of boiling water following packet directions or until al dente, adding the snow peas, asparagus and peas in the last 2 mins of cooking. While the pasta is cooking, whisk the eggs, lemon rind and lemon juice in a large bowl. Add the bacon and half the parmesan. Season. Drain the pasta and vegetables and quickly add to the egg mixture. Toss until well combined and the sauce coats the pasta (the heat from the pasta mixture will cook the egg and form a creamy sauce*). Divide pasta mixture among serving bowls. Top with remaining parmesan.